On 14 July 2015 the New Horizons Spacecraft will fly past the dwarf planet Pluto which lies on the edge of our Solar System. This is the culmination of a nine and half year voyage which started when it was launched in back in January 2006. After it has passed Pluto it will fly past one or two more dwarf planets which lie beyond the orbit of Neptune. It will then leave the solar system into interstellar space, the fifth spacecraft to do so since the launch of Sputnik 1 in 1957, the beginning of the space age. Like the other four spacecraft, New Horizons has a number of artefacts from Earth aboard, to allow for the extremely remote possibility it is found by an intelligent civilisation in the distant future. This post discusses these artefacts and the spacecraft they are carried on. On 3 March 1972 Pioneer 10 was launched from Cape Canaveral on its mission to become the first spacecraft to fly past Jupiter, which it did in November 1973. After passing Jupiter it continued its journey to the edges of the solar system and beyond, becoming the first of only five spacecraft ever to pass beyond the orbit of the outermost planet Neptune. When it leaves the Solar System, Pioneer 10 will drift through interstellar space getting further and further from the Sun. The spacecraft could last for millions, possibly even billions, of years and could in theory be recovered by an alien civilization. In case that should happen, Pioneer 10 carries a simple plaque, shown below. This would tell intelligent beings from another planet where the spacecraft had come from and give them some basic information about humanity. 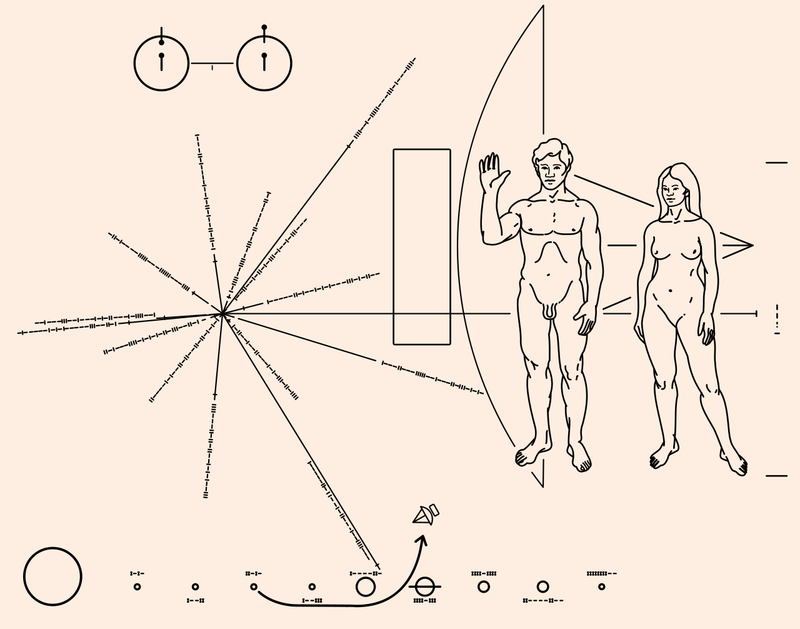 The Pioneer plaque was designed by Carl Sagan (1934-96) and shows four relatively simple things, which he hoped an alien civilisation would understand. On the top left is a diagram of a hydrogen atom. Hydrogen is the most common element in the Universe and emits radiation naturally at a wavelength of 21-cm, when it moves from one state to another. Sagan felt that any intelligent civilisation would know this and understand this diagram. On the right is a figure of a man and woman. The man has his hand raised in a gesture of friendship, although there is no way of knowing whether an alien race would correctly interpret this. The figures have caused some controversy – some have objected to the lack of clothing, whereas others, much more significantly, feel that the fact that both figures are clearly Caucasian does not fairly represent humankind. Behind the figures is a diagram of the spacecraft. The man, woman and spacecraft are all drawn to the same scale. An alien race could therefore figure out how large we are. At the bottom is a diagram of the Sun and nine planets. The arrow indicates which planet the spacecraft has come from. Pluto still features in the diagram, as its demotion to a dwarf planet only occurred in 2006! The fifth item on the plaque is the diagram with 15 lines coming out of it and was devised by Frank Drake, who as mentioned in a previous post was one of pioneers of SETI. The centre of the diagram, from which the lines radiate, represents the sun. The right-hand end of the longest line (at 3 o’clock) represents the centre of the galaxy. The end of each of the remaining lines represents an object called a pulsar. Pulsars are rapidly rotating objects which emit radio waves in regular pulses a few seconds or fractions of a second apart. You will notice that the lines to the pulsars are not smooth – you will see these more clearly if you use the zoom facility – and the marks drawn on the lines depict the length of the pulsar period in time units that an alien might understand. The alien civilisation could then have sufficient information to identify the fourteen pulsars, and thus the location of our Sun and then the Earth. If you are interested, there are additional notes at the bottom of this post explaining the technicalities of this. An identical plaque was sent out in April 1973 on the spacecraft Pioneer 11. This went past Saturn as well as Jupiter and, like Pioneer 10, is currently well beyond Neptune and on its way out of the Solar system and heading out into interstellar space. The next spacecraft launched to leave the solar system were the two Voyagers. Voyager 1 was launched on 5 September 1977 and, like Pioneer 11, flew past Jupiter and Saturn. 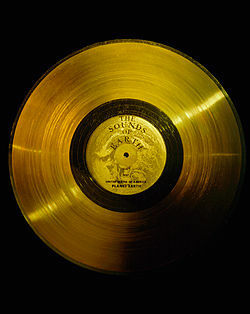 Voyager 2 actually set off a couple of weeks earlier, on 20 August, on a mission to fly past all four outer planets – Jupiter, Saturn, Uranus and Neptune, Each Voyager contained a golden record, the cover of which is shown below. You will notice right away Drake’s pulsar map and the hydrogen atoms, but perhaps less obvious are a picture of the record itself plus instructions for playing it. These instructions use symbols which Sagan hoped aliens would understand. The table below shows where the four spacecraft are now. However, the location given for the Pioneer spacecraft is only an estimate, as they are no longer in contact with Earth. There are two possible reasons for this. Either their power supply has run out, or the radio transmitter is no longer lined up with the Earth and is beaming out signals in a completely different direction. We can therefore only guess where they are, based on their last known location, as they are too small and faint to see with any telescope. The Voyager spacecraft are still in contact and should have enough power to continue transmitting messages back to the Earth until the mid 2020s, but after that we will have to rely on projections for them too. In the table, the distance of the probes on 1 July 2015 is given both in kilometers and astronomical units (AU). 1 AU is the average distance from the Earth to the Sun and is equal to just under 150,000,000 km. The outermost planet Neptune is about 30 AU from the Sun and the nearest star about 250,000 AU away. The speed column shows how the spacecraft s moving away from the Sun in AU per year. 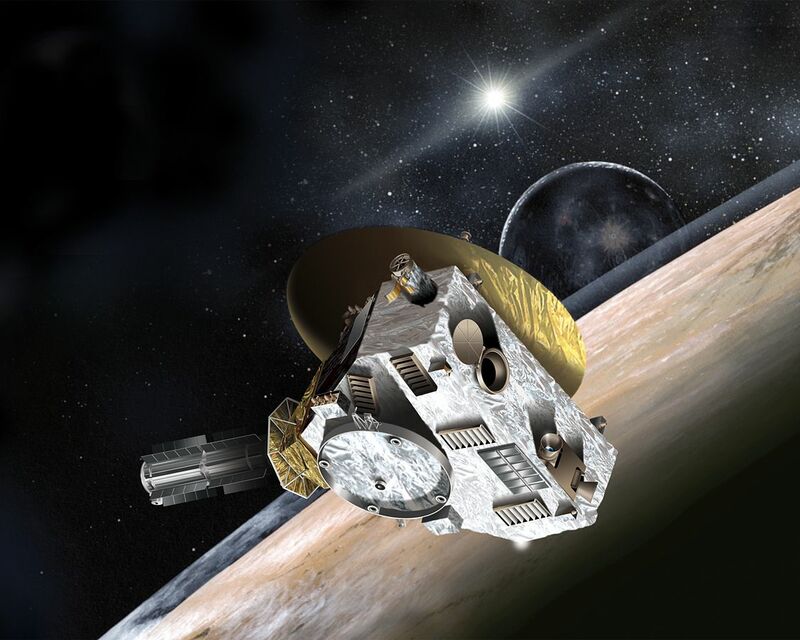 What objects are carried on New Horizons? New Horizons doesn’t have any golden records, plaques or maps to tell an alien civilisation where it came from. Instead, it carries the following nine objects from Earth. A CD with the names of 434,000 people who submitted their details to the project team – I would have loved to do this myself, had I only known about it in time! A 1991 US postage stamp proclaiming, “Pluto: Not Yet Explored”. The reason for there being nine objects is that Pluto was still considered to be the ninth planet from the Sun at the time the mission was being planned. In August 2006 the International Astronomical Union (IAU) downgraded the status of Pluto to that of dwarf planet, on the grounds of it being extremely small. Its mass is only a tenth of that of our Moon. It is ironic that the planet was demoted the very same year the mission was launched. 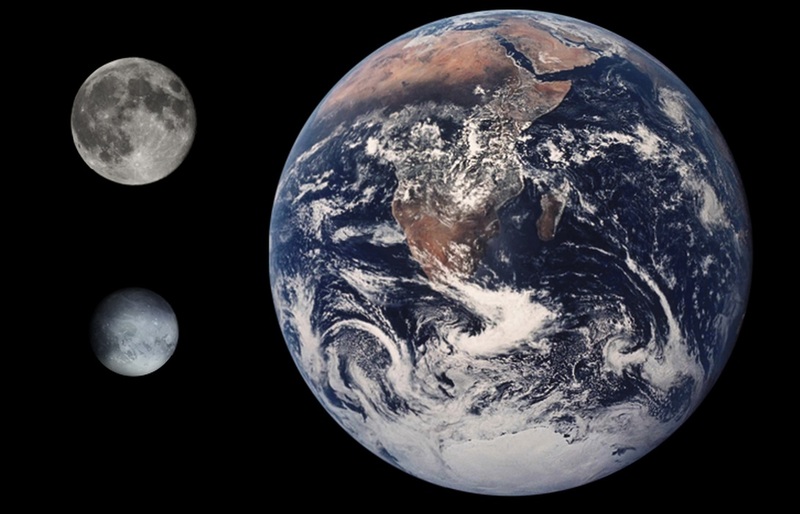 Relative sizes of the Earth, the Moon and Pluto. Will any of the objects ever reach their intended recipients? Even astronomers who think that alien life is widespread within our galaxy think that it is very unlikely, given the vastness of space, that any of these five spacecraft will ever reach an alien civilization able to recover the objects sent for their perusal. The spacecraft are small and their power sources will have long since died, thus making them unable to transmit a signal which could be picked up. I personally believe that we are alone in the galaxy. If I am right, there is no alien race in existence to find the objects, let alone one intelligent enough to decipher them. More likely, but still incredibly unlikely in my opinion, is the possibility that in the far distant future, long after the Voyagers, the Pioneers and New Horizons have been forgotten, mankind itself may leave Earth and colonise planets around other stars, and in millions of years time our descendants could discover one of these craft and its contents. It is fascinating to think about what they would make of them. 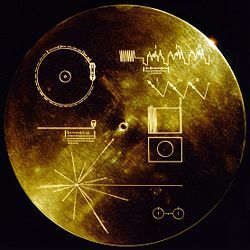 The Pioneer plaque and the Voyager golden record have made numerous appearances in popular culture including science fiction series such as Star Trek, Buck Rogers and the X-files. In an episode of the”The Simpsons”. The Pioneer plaque is shown with an alien holding the plaque upside down struggling to make sense of it! Clearly Earth-based units of time such as seconds would be meaningless to an alien. Therefore Drake used the transition of a hydrogen atom, shown on the plaque, to create a time unit he hoped an extraterrestrial race would understand. When a hydrogen atoms flips from one state to another it emits radio waves at a wavelength of 21.1 cm. A wavelength of 21.1 cm corresponds to a frequency of 1,420,406,000 cycles per second. So each individual cycle corresponds to a time interval of 0.000 000 000 704 seconds. All the pulsar periods are expressed in multiples of this fundamental time interval. Pretty cool. I was unaware of most of that. I liked the plaque, of everything that made the most sense me from an informational standpoint. Fascinating thanks, and like most cosmological thoughts and ruminations, only serves to emphasise our insignificance against the vastness of existence. The chances of the plaques being spotted, let alone, understood, by another civilisation, and one intelligent enough to understand it, must be vanishingly small. However….if perhaps we accept that the universe is infinite, then by inference all possibilities are infinite, eventually.. I heard on the radio today that chimpanzees and us humans are very much more genetically similar than mice are to rats, about 90% more similar I think. And it used to be hypothesised that if you gave an infinite number of monkeys an infinite number of typewriters (or perhaps versions of ms word, or infinite numbers of quill pens, volumes of ink and parchment ) eventually one would come up with the works of Shakespeare. Well, it could be argued that that has already happened, Shakespeare, like the rest of us , genetically very similar to our simian ancestors, came up with the works of – – -Shakespeare, what were the chances of that happening? So there’s hope for those little spacecraft after all. Seriously though, will New Horizons tell us much about Pluto? Thanks, very interesting. I always enjoy your science lessons, Geek. I was a bit disappointed in what went into the last vehicles. At least the first two could almost speak for the whole Earth but the last objects included were definitely U.S. It only goes to prove that we are not a united world by any means. Thanks for the lesson. Thank you very much for your comment and I’m glad that you’re still enjoying my blog. Your post was a lot of fun to read. There was an interesting article on Pluto in New Scientist a couple of weeks ago, debating among other things the terminology – planet, dwarf planet or whatever. I’m not going to debate the existence or otherwise of other (intelligent) ‘life’. However, I do wonder if it matters. Factor into the Drake Equation the probabilities inherent in homo sapiens’ four billion year evolution and anyone can see we’re not going to be talking to Spock or Worf any day soon! Wonderfully comprehensive and descriptive post. So much to learn and review. Your love for the subject is so obvious! We think the Pluto debate will go on for a while. Pluto was demoted form being considered a planet a few yrs ago wasn’t it. But I thought sphericality was one feature determining whether a body was called a planet! ?